I've been reading Camy Tang's blog for a couple years and I've read all of her books and I think she is just fabulous! 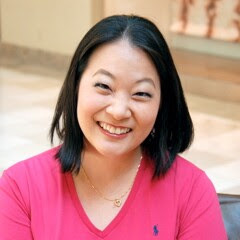 Camy has graciously agreed to do a guest post for me so without further ado- Camy Tang! I’m so excited to be here on Tara’s blog! The best part about writing novels is that I get to include little personal things in my books. I absolutely love food, so I always include one or two foods in my books that are special to me. In my romantic suspense, Deadly Intent, the heroine’s family is having a get-together with friends and family. At get-togethers with my family, my mom will usually make Chinese chicken salad. Whisk together dressing, adding or subtracting quantities to personal taste. (Optional) My mom will sometimes soak the celery in the vinegar for a few minutes, then remove the celery and make the dressing. Toss the celery with the other salad ingredients later. (Optional) Cut won ton skins into strips and deep fry until golden brown. Drain and cool. Toss all ingredients together. Serve immediately. I hope you enjoy reading Deadly Intent! Now when you read about the get-together and the Chinese chicken salad, you’ll feel like you were there! Thanks for having me guest blog for you today, Tara! The Grant family’s exclusive Sonoma spa is a place for rest and relaxation—not murder! Then Naomi Grant finds her client Jessica Ortiz bleeding to death in her massage room, and everything falls apart. The salon’s reputation is at stake...and so is Naomi’s freedom when she discovers that she is one of the main suspects! Her only solace is found with the other suspect—Dr. Devon Knightley, the victim’s ex-husband. But Devon is hiding secrets of his own. When they come to light, where can Naomi turn...and whom can she trust? Camy Tang writes romance with a kick of wasabi. She used to be a biologist, but now she is a staff worker for her church youth group and leads a worship team for Sunday service. She also runs the Story Sensei fiction critique service. On her blog, she gives away Christian novels every week, and she ponders frivolous things like dumb dogs (namely, hers), coffee-geek husbands (no resemblance to her own...), the writing journey, Asiana, and anything else that comes to mind. 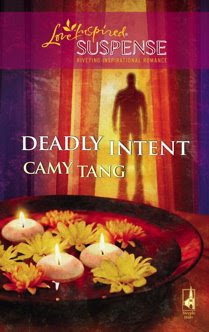 Visit her website at http://www.camytang.com/ for a huge website contest going on right now, giving away fourteen boxes of books and 30 copies of her latest release, DEADLY INTENT. Thanks for visiting my blog Camy! You can find Camy Tang's blog HERE. Thanks so much for introducing me to a great new author. I look forward to visiting her blog and checking out her books as well (and also trying out that yummy recipe)! I won a book from her site and she sent me some beautiful bookmarks. I was so pleased with them! I'm planning on reading Deadly Intent it sounds like a great read! Thanks so much for hosting me on your blog, Tara! Erin and Heidi, I hope you like Deadly Intent!